Love a frozen margarita? This one takes the cake. A strawberry, lime juice and cream cheese filling tops a pretzel crust for a perfect way to chill out. Mix pretzel crumbs and butter in 13x9-inch pan; press onto bottom of pan. Refrigerate until ready to use. Combine condensed milk, puréed strawberries and lime juice in large bowl. Gently stir in COOL WHIP; spread over crust. Freeze 6 hours. Remove from freezer about 15 min. before serving; let stand at room temperature to soften slightly. Serve topped with sliced strawberries. Stick to the serving size. 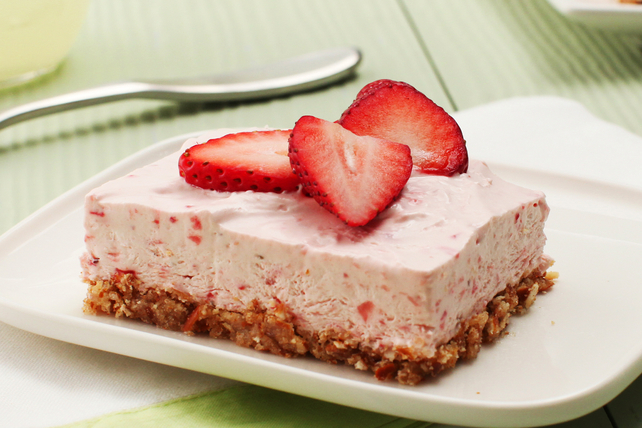 A small portion of this rich strawberry dessert is all that is needed. Prepare dessert as directed, pressing crumb mixture onto bottom and up side of 9-inch pie plate before adding strawberry filling and freezing as directed. For easy cutting of frozen desserts, run a sharp knife under hot water before use.